Greenhouse Gases, or GHG’s are those unwanted gases that exist in our atmosphere and as such contribute to global climate change, either directly or indirectly by trapping the Earth’s heat and making our planet warmer. Although some of these greenhouse gases occur naturally within the atmosphere, the result of human and industrial activity on the Earth has increased their quantity altering and affecting the atmospheric balance. We all know that the Earth’s atmosphere is slightly more warmer than we would normally expect it to be, due mainly to the effects of direct solar heating of the greenhouse effect. Normally the Earth is heated by both visible and infra-red light coming directly from the Sun. The heated surface then emits back the infra-red light. The small amounts of greenhouse gases present in the atmosphere absorbs and re-emits the infra-red radiation back to Earth in all directions, effectively trapping it within the atmosphere. As a result the Earth naturally experiences a mild greenhouse effect keeping the temperature at the Earth surface just right, that is not too cold, and not too hot. This allows humans to live happily on the planet and just as important, for most of the water at the surface to stay in liquid form. The two primary gases in the Earth’s atmosphere are Nitrogen (N2) and Oxygen (O2) which we breath, but themselves do not absorb infra-red radiation or play any significant role in setting the temperature of the planet so are therefore not classed as a greenhouse gas. 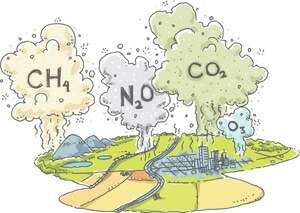 But as well as Nitrogen and Oxygen, there are small amounts of Carbon Dioxide (CO2) and water molecules in the atmosphere which does affect global warming but normally these are regulated by the Earth’s annual cycle and temperature. However, due to man’s activities over the last centuries, the atmospheric concentration of carbon dioxide has increased increasing the global temperature. The burning of fossil fuels to generate electricity, primarily consumed by households and industry, has resulted in a major increase in coal consumption thereby increasing our carbon footprint and increasing our overall emissions of greenhouse gases. So in order to reduce the quantity of greenhouse gas pumped daily into our atmosphere, we must reduce the combustion of fossil fuels by improving the way we both use and burn fossil fuels. But an increase in fossil fuel efficiency is not a form of alternative energy but will go some way in reducing greenhouse gases. Industry will therefore have to play a major role in reducing its harmful gas emissions by increasing the efficiency of their production processes making them a cleaner less energy consuming process which will help reduce the amount of electricity being generated to meet the demand. Also installing energy efficient machinery or using more efficient energy sources, or finding alternative energy sources which when burnt create or emit little or no carbon gas. But as well as the burning of traditional fossil fuels, the burning of methane which is a component of natural gas and therefore non-renewable, produces yet more greenhouse gases as during combustion the methane combines with oxygen to form water, heat and carbon dioxide. Also, methane as a gas, is more effective than carbon dioxide at trapping heat within the atmosphere and contributing to the overall global warming problem. However, methane (CH4) obtained from burning biomass and biomass resources such as landfill solid waste, agricultural activities, animal manure, etc, produces biogas via a process known as anaerobic digestion, which is classed as renewable. Around the world huge amounts of greenhouse gas emissions have been prevented by the development of waste-to-energy facilities compared to open landfills and the recovered waste gases and biofuels are used in the generation of energy in the form of heat, electricity, or combined heat and power has became an alternative way of dealing with unwanted waste producing no greenhouse gases or other atmospheric pollutants. But whatever the beneficial effects of burning fossil fuels it is becoming more clear that the consumption of traditional fossil fuels at their current levels releases too many pollutants and gases into the atmosphere resulting in the thermal properties of the Earth’s atmosphere changing as a result. Today, the Earth’s atmosphere retains more of the Sun’s energy than it ever did before mankind began to consume large amounts of fossil fuels. While many of the long term changes and effects to the atmospheric chemistry are still not yet fully clear. Increases in ocean and atmospheric temperatures are already having an effect on the powerful currents that flow around the oceans distributing its thermal energy as it goes. The effects on the distribution of the suns thermal heat around the planet is causing an increase in the average global temperatures. Sea levels have risen worldwide approximately 15-20 cm (6-8 inches) in the last century. Some of this rise is a direct result of the melting of mountain glaciers and the polar ice-caps, while some has resulted from an expansion of oceanic waters that have resulted from the warmer ocean temperatures. What is becoming increasingly clear is that the chemical composition of Earth’s atmosphere is changing. But what about the future of greenhouse gases? Concerns over the potential impact of global warming and its effects have resulted in many countries around the world establishing commitments under the Kyoto Protocol to reduce greenhouse gas emissions. The development and use of alternative energies as part of their electricity demand has help to meet some of these commitments by off-setting or reducing the air pollution that would otherwise be caused by the burning of fossil fuels in conventional power plants. Climate problems could be solved by the implementation of various strategies. The stopping of greenhouse gas emissions (and not just reducing them), by promoting and using zero emission technologies, and by completely stopping the combustion of fossil fuel or the use of nuclear energies but instead replacing them with renewable technologies that emit zero greenhouse gases. Clearly, the harnessing of a multitude of green and clean energy sources is the only plausible way to satisfy our current energy demands. We know that the amount of free solar energy reaching the Earth’s surface in just a few hours is more than enough to power the globe for the full year. This is thought provoking enough and therefore fully justifies our attempts to use solar energy. Harnessing this free and unlimited energy source at at sufficiently high enough efficiencies is considered by many as a major challenge, but the development of new technologies fuelled by the sunshine which do not release any greenhouse gases are now becoming main stream. To learn more about how greenhouse gases are affecting our planet, or if you just want to explore the advantages and disadvantages of how renewable energy can help reduce greenhouse emissions, then Click Here to get direct from Amazon your copy of one of the leading books on greenhouse gases and carbon emissions today. Sir. I am researching the greenhouse gas effect and was reading this article and have some questions which i hope this community could (respectfully) answer, why all the heat radiated by the earth on night would not escape right away to space without bounce back in the atmosphere. The Earth absorbs or reflects most of the sunlight it receives from the sun and if there were no upper atmosphere it would indeed return back to space. However, the Earth’s atmosphere is made up of many different layers, clouds and gases which naturally keep the Earth warm. The reflected infra-red light energy is absorbed, or at least slowed down, by these before it can leave our atmosphere back into space. This increase in atmospheric absorption increases the global temperatures resulting in Global Warming and the more greenhouse gases in the atmosphere the warmer the Earth will get.